My brother Wouter wanted something new, to replace his Gaastra Plasma technora 8.3. 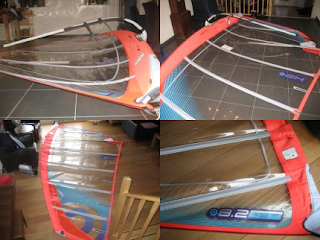 This gaastra plasma was his favorite sail for a long time, the behaviour fitted perfectly to a weekendsurfer. Soo it was hard to make a choise, my positive experience with the RS:Slalom MK3 made us doubt between H2 and RS:Slalom MK3... The gaastra plasma is a very strong build sail, my brother likes some extra strenght, soo we chose the Neilpryde H2. Now I have seen the sails profile and it seems each year the performance difference between RS:Racing- RS:Slalom-H2/V8 gets smaller. The H2 should be very good when just looking at the sail rigged. We used a arrows 460 mast, this one we still had. I think the bendcurve should work good. Sails profile looks nice, but i'm not sure if i like these (new)colors, looks bit "lolly pop". Maybe in real world it looks better. Are the Ultra Cams a lot smaller then the Ultra Cams in the RS:S/ Evo II.